Close your eyes and imagine yourself running a trail ultramarathon in the beautiful Australian outback. You’re enjoying the experience when suddenly you find yourself trapped in a gorge, surrounded by a raging brushfire. The flames quickly close in until you’re surrounded on all sides. This is how it ends, you think. Against all odds, death is averted. Instead, you lie comatose. Months pass in dormancy. Finally your eyes open, awakening to discover you’re miraculously alive, yet somehow less than whole. A glance at your left hand reveals several fingers missing. On the right? No thumb. And the reason you can’t move? 65% of your body is covered in life threatening burns. Overwhelmed, you allow your eyes once again close, welcoming the comfort of darkness. 200 operations follow. Over the next two years, you will die three times during surgery. Miraculously, you somehow survive. Not as a victim, but as a hero. 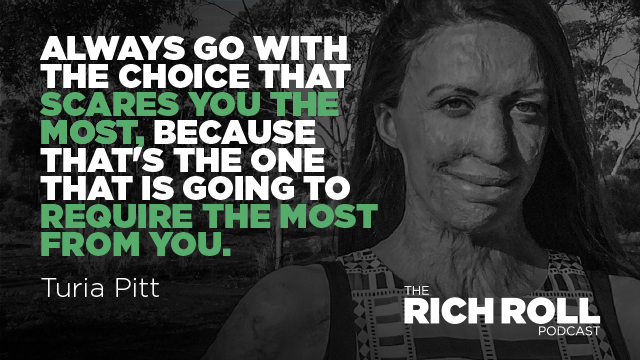 This is the powerful story of Turia Pitt – humanitarian, athlete, and beacon of inspiration and female empowerment to millions across the world. One of Australia’s most admired and widely recognized people, Turia has been profiled everywhere from 60 Minutes to Women’s Weekly. She has scaled the Great Wall of China, competed in the Ironman World Championships and walked the Kokoda Track. A sought-after public speaker, Turia has mentored thousands through her online programs, raised funds and awareness for a variety of philanthropic concerns and authored two books — the recently released Unmasked (available in the US in audiobook format only) and Everything To Live For. This is a conversation about turning tragedy into opportunity. Adversity into advocacy. And experience into service. It’s a conversation about the importance of putting others before yourself and serving those less fortunate. But most of all, this is a powerful conversation about facing life head on — about taking risks, facing your fears and believing in yourself. It was an honor to spend a couple hours with Turia and her fiancé Michael during my recent visit to Sydney. My hope is that our exchange will leave you feeling inspired, empowered and grateful. Or as Turia says, no whinging! Boll & Branch: The first honest and transparent bedding company that only uses sustainable and responsible methods of sourcing and manufacturing. Go to BollandBranch.com today for $50 off your first set of sheets by typing in promo code “RICHROLL”.